In the popular imagination, the business media, and the schools of business and management that train new generations of entrepreneurs and executives, achieving extraordinary success in business is attributed to far-sighted individuals who have taken bold risks, provided innovative leadership, and introduced new products, services, or ideas superior to those of the competition. Amid the growing skepticism about the means by which vast amounts of wealth are accumulated and its consequences, however, this belief is long overdue for reevaluation. 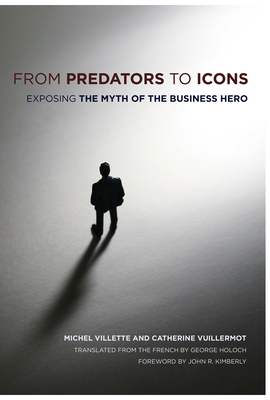 In From Predators to Icons, Michel Villette, a sociologist, and Catherine Vuillermot, a business historian, examine the careers of thirty-two of today's wealthiest global executives--including Warren Buffett, Ingvar Kamprad, Bernard Arnault, Jim Clark, and Richard Branson--in order to challenge the conventional explanations for their extreme success and come to a better understanding of modern business practices. In contrast to the familiar image of the entrepreneur as a visionary with a plan, Villette and Vuillermot instead discover a far less dramatic process of improvised adaptations gradually assembled into a coherent course of conduct. And rather than being risk-takers, those who are most successful in business are risk-minimizers. Huge gains, these case studies reveal, are most reliably obtained in circumstances where the entrepreneur has established careful provisions for risk reduction. As for the view that innovation makes success possible, the authors find that because innovation is an expensive process that takes a long time to produce profits, innovators first of all require capital; success makes innovation possible. The necessary resources, they show, are most often derived from what they provocatively term "predation": ruthlessly taking advantage of imperfections, weaknesses, and vulnerabilities within the market or among competitors. Finally, From Predator to Icon considers the "practical ethics" implemented during the phase in which capital is most rapidly accumulated, as well as the social consequences of these activities. Drawing on interviews with some of their subjects and, crucially, close readings of the authorized biographies and other hagiographic accounts of these figures, which eliminates the bias of malicious interpretations, Villette and Vuillermot provide revelatory insights about the creation and maintenance of business wealth that will be profitably read by both the captains and the critics of contemporary capitalism.